NEPALGUNJ, May 2: It has been eight months since the Rapti floods wreaked havoc in the western plains of the country. However, the plights of the victims displaced by the floods have still not been addressed. Firiya Chaudhary, a local of Samshergunj in Nepalgunj, still has not completed reconstruction of his house which was severely damaged by the floods. One of the main reasons for not completing the reconstruction is the fear that floods would occur again and lay waste to the reconstruction efforts. “Till now, we are relying on the damaged house. 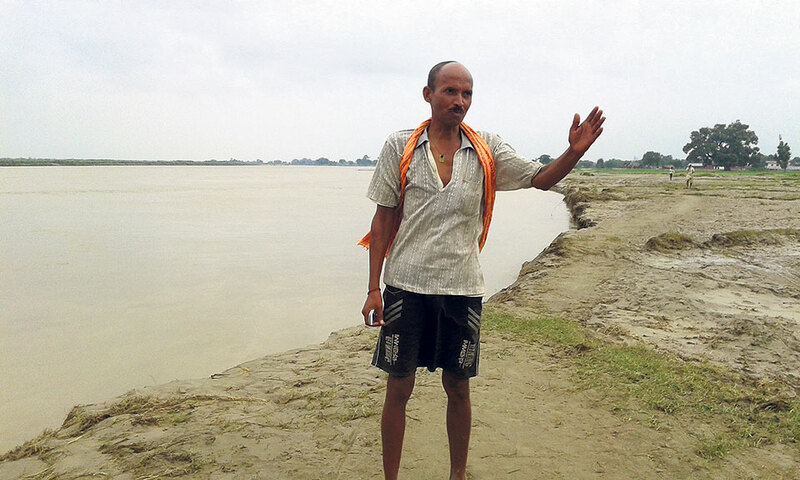 Another monsoon is near and we fear that floods would return again and cause great damages,” said Chaudhary, whose husband works as a daily-wage laborer to earn livelihood for the family. As income generated from the work is barely enough to feed his family twice a day, Chaudhary said it would be too risky to spend money on reconstruction. “The money earned through grinding stones is sufficient only for food and we do not have other sources of income. We cannot afford the reconstruction. Even if we get loan, we fear recurring floods would not keep our house intact,” she said. The village is nearby the Rapti River. Even during small flooding, floodwater easily enters the settlement. There is no embankment to prevent floods from entering the village. During every monsoon, the Rapti River toward the south and other rivers from the north wreak great havoc in their village, according to the locals. As Rapti floods wreak havoc every year, locals of Samshergunj have stopped reconstruction works after. Their fear grows whenever it starts raining. Due to the problem of floods, many victims have left the settlement and built temporary makeshift tents in nearby hilly settlements. Locals of the neighboring settlement in Tikulipur also face the same problem. Last year's floods had displaced every household of the settlement. Floods had been troubling them time and again since a long time. “We barely saved ourselves during the flood last year. We are starting to get worried as the monsoon is not far away,” said Maimakala Rana of Tikulipur. Although the next monsoon is just two months away, the government has not taken any initiative to build concrete embankment to prevent floods. The concerned authorities also have not paid any attention to bring reconstruction and rehabilitation programs for the victims. Complaints of the victims are falling into deaf ears. Narendra Kumar Chaudhary, chairman of Daduwa Rural Municipality, said they are making preparations to minimize damages from floods. “Floods have been adding us lots of problems. We are taking measures to contain damages from floods,” he said.